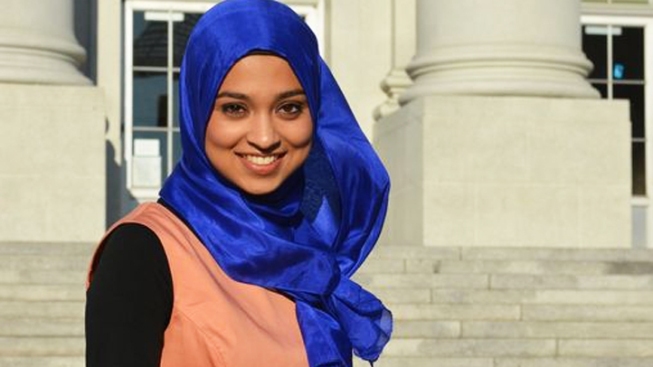 UC Berkeley senior Sadia Saifuddin would become the first practicing Muslim to hold the post if she is confirmed. The University of California's governing board is poised to vote Wednesday on a new student member who would be the first practicing Muslim to hold the post and whose nomination is being vigorously opposed by some Jewish groups. UC Berkeley senior Sadia Saifuddin, 21, was picked from a field of 30 applicants to serve on the UC Board of Regents during the 2014-15 academic year. The board will vote after its meeting begins at 9 a.m. at UC San Francisco's Mission Bay campus. The Simon Wiesenthal Center in Los Angeles, the pro-Israel group StandWithUs, conservative commentator David Horowitz and others have called on the board to reject Saifuddin's appointment. They say they oppose her not because she is Muslim but because they say some her student political activities as a student senator and member of the Muslim Students Association at Berkeley disqualify her from representing the UC system's more than 222,000 students. Others say she is a bridge-builder, however, and say that unsubstantiated criticism is coming from far-flung fringe groups. No one on either side, though, seems to dispute the activities she has engaged in. Some of those activities included co-sponsoring a bill calling for the divestment of university funds from companies with economic ties to the Israeli military or Israeli settlements on the West Bank, and authoring a resolution condemning a UC Santa Cruz lecturer who had linked the Muslim Students Association with terrorism "for inciting racist and Islamophobic rhetoric." In April, she wrote an op-ed piece - free of anti-Israel vitriol - for the Daily Cal voicing her support for the student body voting to divest from funds from companies committing human rights violations in the Palestinian territorities. "We think an appropriate Muslim candidate could have been and would be a wonderful student regent," said Aron Hier, the Simon Wiesenthal Center's director of campus outreach. "This has nothing to do with religion. It has to do with opportunism and championing things she cares about on the one hand and trampling on things other people care about on the other." In addition, Horowitz and Jeffrey Wienir wrote an open letter to the UC Regents in June voicing their concerns about her, as she has engaged in "Israeli Apartheid Weeks" and has been an active participant in the boycott of Israel, a move many Jews feel is anti-Semitic. However, Zahra Billoo, executive director of the San Francisco-Bay Area chapter of the Council on American Islamic Relations in Santa Clara, Calif., attended the Regents meeting in San Francisco in support of Saifuddin. Billoo told NBC Bay Area that critics have attacked the young student activist for being "divisive," but in all the vetting of her, most have found her to be a "bridge-builder." Saifuddin, who was born and raised in Stockton and is majoring in social welfare at Cal, was not available for immediate comment, though she said she'd talk during a break in the meeting. But in a statement last month announcing her nomination, she described herself as an advocate for students. "I'm looking forward to learning about different students and their struggles, having conversations with them and doing the best I can to help," she said. "I'm in a very privileged position in that I'm able to give back and make sure that the people who come after me have the same opportunities I had." Her student government profile states that she loves that "Cal has a culture of teaching everyone that walks through Sather Gate to decolonize their mind." She also wrote that she hopes to "increase collaboration between student groups to work toward creating a more positive and inclusive campus climate." Her blog contains nothing that is anti-Israel. Started in May 2012, the blog has just a few entries, including a message to students to vote for Prop. 30 and to pass a resolution condemning Islamophobic hate speech at UC. In a June article in the Los Angeles Times, she said her main priority was to block more tuition increases and talked about how her faith drives her to service and to finding common ground. Jonathan Stein, a Berkeley law school graduate who recently completed a one-year term as the UC student regent and was part of the five-member committee that recommended Saifuddin, said Saifuddin's critics have overlooked her work to build bridges. He cited her work bringing Muslim and Jewish students together during the divestment debate and founding the Berkeley campus' first interfaith worship space. "The really negative response that's come, that has characterized Sadia as extremist, intolerant, I guarantee that is coming from people who have never met her in person," Stein said. "She is, in fact, an incredibly mature, thoughtful, tolerant person." On Wednesday before the vote, when school was out because of summer break, there was little to no buzz on campus regarding her election. Some students noted that many people on the ultra-liberal campus participate in Israel boycott activities, no matter what their faith. The Israeli-Palestinian conflict has been a regular flashpoint for students and faculty members at the University of California. As student regent-designate, Saifuddin would participate in meetings but wouldn't be able to cast votes during the school year that begins this fall. If selected, she will be the 40th student regent. The 2013-14 student regent is Cinthia Flores, a law student at UC Irvine.